as I really like the math behind 40k I use MathHammer extensively. Lately, I felt the need to get some more detailed information about the probabilities involved in 40k and decided to start a small project called ProbHammer (Probability Hammer). 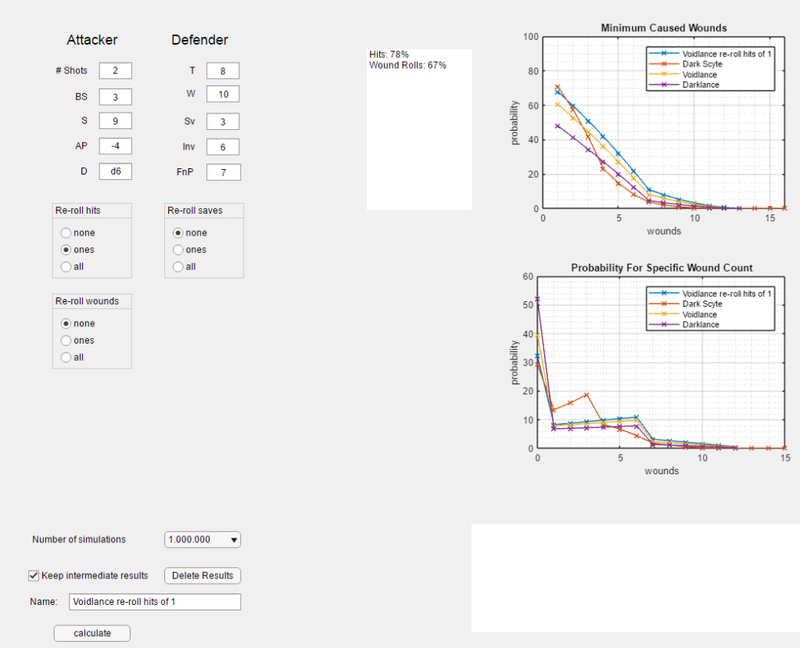 I use Monte Carlo Simulations to calculate not only the expectation of the wounds like MathHammer does it, but also the probability distribution. Till now this was more a project for me alone, but I thought that I should share it with the community to get more input and suggestions. Below is a screenshot to show you what I mean. The first graph shows the probability to do equal or more the wounds listed on the x-axis. 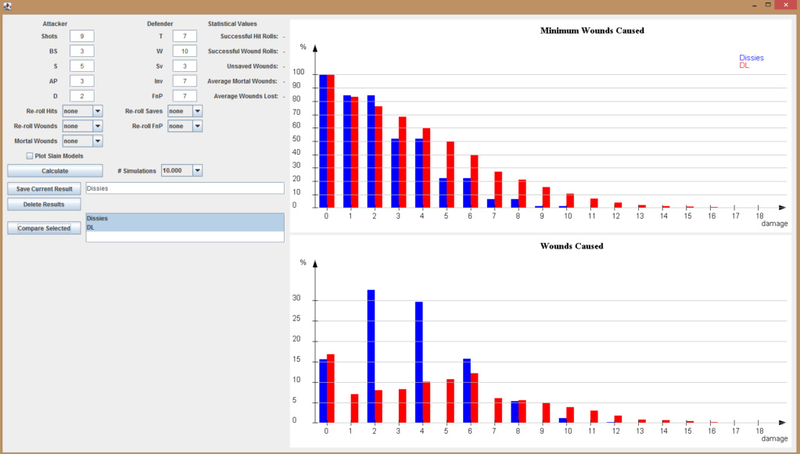 The second graph shows the probability to do exactly the wounds listed on the x-axis. Haywire and many other rules are still missing but should be added soon. What do you think? Who of you thinks this additional information could be useful? Definitely a useful tool from the looks of it - just working with expected value misses out on a ton of meaningful information. You can calculate any weapons you want. Just put in the numbers into the text fields. If you want you can download this early version from Dropbox. The only problem is that you need the Matlab Runtime Environment which the installer will download for you. This is about 1.2 GB of Data. EDIT: That's also a reason I would like to know if people are interested in this. If they are I could write the whole app in a different environment making distribution easier. But if this is just a project for me and my friends it's simply too much effort. If you made this into an app, I would totally download it! 100% I would pay for this. This is pretty awesome mate - nice work. When I have some more free time, I'll take a look deeper. If you go the app route, I'd suggest having a free and paid version, with things like saving configurations etc in the paid. I like the idea, but I would probably use from my phone and the Matlab requirement would be a problem for me. These types of programs and reports from programs are pretty sweet. Along these lines, I've been wondering about a simple assumption to use for math during a game. Calculating average damage is pretty easy, but with the whims of dice the average isn't a good way to estimate the number of shots to put into a target. What do folks think of calculating the average damage for one point less of ballistic skill (or WS)? It isn't perfect, but it provides a ballpark for a "low end" of average. You could add an option to weight the effect of non-equal probability on the dice. A guy empyrically tested the randomness of different set of dice and found that the 1's have a much higher chance to appear. You can read the complete test here. Thanks for the replies. I think I will port everything in a Java App. Started yesterday and it's taking shape by now. 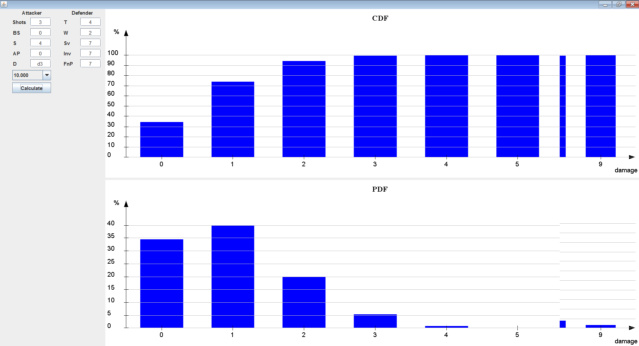 Managed to write the code for some bar plots and the basic simulation logic is in place. As to the paid version I could think of free versions for PC and maybe apps for 1-2€ in the Google Play Store. I'll keep you up to date. I will probably need some testers soon. As this is something that I could definitely do later on (I just need to alter the Dice class I use to create the random results), you came up with a good idea. I would like to change this thread a little bit, so everybody can post features she or he would like to have in the app. Of course, I'm going to implement the stuff MathHammer has. The only thing I'm missing right now is all the mortal wounds stuff and dmg alteration like always subtract one or half the dmg. Please everybody post your ideas and wishes. I'm not sure if I will be able to implement all of them, but I think this is a good start. EDIT: I added a link to the current alpha build in the first post so everybody can test it. I uploaded a newer Version that should support most of our needs including direct comparison of different stats, re-rolls and mortal wounds. EDIT: You can also switch between wounds caused and models slain.